Connie Peterson began work in the New York Henson workshop in 1980 making costumes for ‘Sesame Street Live’. She went on to make swimming pigs for ‘The Great Muppet Caper’ and Gorgs for ‘Fraggle Rock’ and continues to create costumes and large puppet bodies for The Jim Henson Company today. Connie recently shared her memories of her London Labyrinth experience. In July 1983, I arrived in London to start work on Labyrinth. Jim had assigned me the task of heading up the puppet workshop for the film. I had been working for him for a few years making large costume characters for Sesame Live, and swimming and roller skating pigs for The Great Muppet Caper and The Muppets Take Manhattan. At first, there were only five of us on the Labyrinth crew (Brain Froud, Sherry Amott, Mike McCormick, his son Sean, and myself, shortly to be joined by Linda McCormick). All of them were veterans of The Dark Crystal, so I was the stranger in the mix. Getting started was really difficult – it was hard to know where to grab hold of the project. Jim was still in New York directing and performing in The Muppets Take Manhattan, so we were on our own. The situation was made harder due to an architectural modification of our building at 1b Downshire Hill Road before our arrival. The main work space was filled with an impenetrable pile of stuff from the front of the building to the back, without so much as a pathway through it, an incongruous pile ranging from heavy machinery to feathers and sequins all jumbled together and coated with construction dust. We gradually sorted ourselves out and made space to work in and set out to establish the relative sizes of the main characters. A human teenager was a given, and fairly soon we had a height for Hoggle since Jim met Shari Weiser while working on the Muppet film in New York. We worked out mock-ups of Ludo, Didymus, Hoggle and typical Goblins to show Jim when he was able to come to London. (Of course this was before instant communication via internet, digital pictures, etc.). We proceeded from there. Working on that film was a huge task and an enormous learning experience for me. I had to get familiar with the British film unions and their regulations, British names for products (Perspex instead of Plexiglas, for instance), regulations regarding health and safety and the Factory Inspector’s building and equipment requirements, interaction with neighbors and the local council (since our building was zoned for light industry in an otherwise residential area), meeting and interviewing prospective staff, on and on. I will always be tremendously grateful to Jim for offering me the opportunity to live in London, and stretch myself in so many ways. What I learned working on that film has informed everything I have worked on since. It was so valuable to me on both a personal and a professional level. Thanks, Jim. 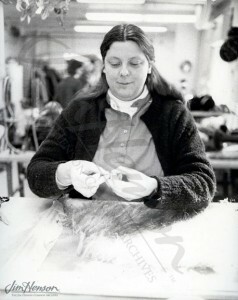 Connie Peterson making Gorg fur for Fraggle Rock, early 1980s. This entry was posted in 07-July '83, 1983, Dark Crystal, Fraggle Rock, Great Muppet Caper, Labyrinth, Muppet Movie, Muppets Take Manhattan, Productions and tagged 1B Downshire Hill Road, Brian Froud, Connie Peterson, Creature Shop, Hoggle, Linda McCormick, London, Ludo, Mike McCormick, New York, Sean McCormick, Sherry Amott, Sir Didymus. Bookmark the permalink.